Turbochargers aren’t a common addition to a custom pickup truck, as most builders tend to go with a more tow-friendly supercharger installation when it comes time to choose a power adder. Some Toyota Tacoma owners, however, want to make their vehicle as unique as possible in the pursuit of additional horsepower, and as a result a small sliver of the forced induction market has dedicated itself to providing turbo kits for the compact pickup. 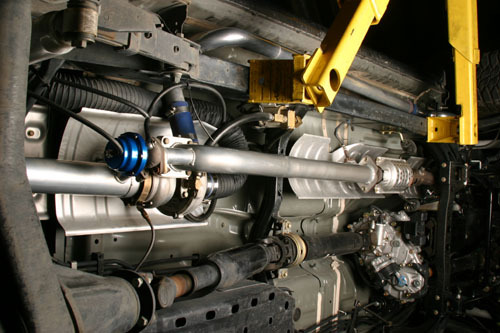 Squires Turbo Systems, better known as STS, offers a remote tubocharger kit that is designed to fit the 1996-2000, 2001-2004 and 2005-2009 V6 editions of the Toyota Tacoma. What makes the STS kit so unusual is that it is a remote design, which means that the turbocharger isn’t actually located inside the engine bay, but underneath the vehicle’s chassis towards the rear. This type of setup is usually offered when there is no room under the hood to install all of the necessary plumbing, or when putting together a “universal” kit that can fit more than one model of car or truck with only minor modifications. 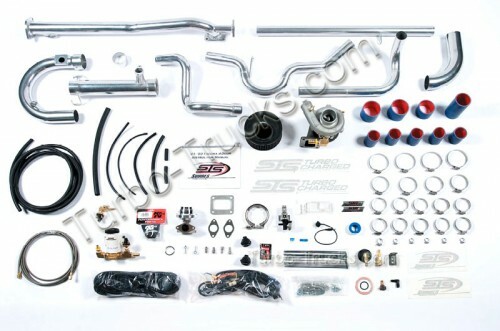 The contents of the STS Tacoma turbo kit. The STS kit comes with a T04B Garrett turbo, a TiAL wastegate, a blow-off valve, a Walbro fuel pump and a K&N air filter. All of the required piping and mounting hardware is also included with the kit. All three kits offer a very modest four psi, and according to STS produce 224 horsepower at the rear wheels, along with 278 lb-ft of torque (an advertised 60 percent improvement). It is important to note that STS does not offering any ECU tuning to go with the 1996-200 or 2001-2004 turbo kits. A fuel management unit that mechanically raises fuel pressure when boost is detected is included with each of these offerings, but the lack of proper engine tuning restricts boost to such a low level in order to maintain safe operation. Curiously, some vendors are listing the 2005-2009 version of the kit as coming with a Unichip, but turbo output is still reported as a conservative four psi, which makes it difficult to understand what exactly the chip is providing in terms of tuning. 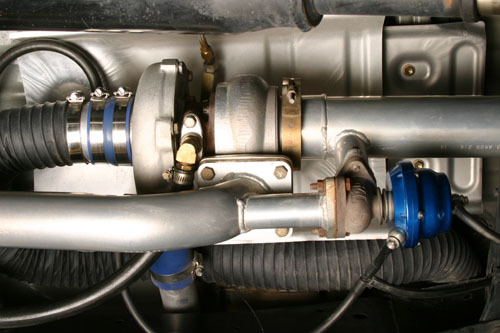 A closer look at the STS turbo nestled up underneath the Tacoma’s chassis. If you dig around, there are also “custom” turbo kits out there for four-cylinder Tacomas, but once again, these are essentially kits that could be put together from any turbo parts list as they lack an integrated tuning option. The STS Tacoma turbo setup looking along the length of the chassis. The STS turbo solution is certainly more “exotic” than a supercharger, but whether it actually delivers better performance is up for debate. If forced induction is your thing, and you are comfortable paying in the neighborhood of $4,000 for a kit, then the STS turbo setup might be a viable option for generating more power. However, if you live in a winter climate, then you might want to think twice about mounting too much hardware under your truck’s chassis where the corrosive effects of water, snow and salt could quickly reduce the lifespan of the turbo kit. The same is true if you are into off-road driving, as it would be all too easy to get hung up and tear apart the turbo piping and mounting brackets out on the trail. The STS kit should be thought of as suitable for race-only or warm weather street applications exclusively, not as an all-around power adder option. I have a 2000 4WD 4 cyl. Tacoma 4×4 which I would like to power up vs a bigger engine. Whats my cost on the turbo kit? Is premium fuel required for this low boost 5-6 psi turbo kit? I have a 06 tacoma x-runner with the 4.0 1gr how much boost can I get with the stock motor.